Here’s yet another way to convince senior executives and other colleagues that a strong compliance program matters: misconduct at the company can trim the salary offer those people might get at their next job — by 4.6 percent or more, apparently. So says a fascinating paper from Harvard Business School, where two professors examined a wide range of job placements and pay data since 2004. 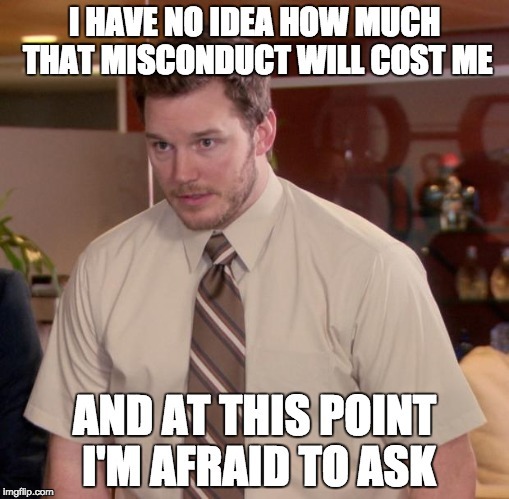 They found that the stigma of listing a discredited company on your resume, even if you had nothing to do with the misconduct there, leads recruiters at your next employer to pay you less. It’s not news that listing tainted employer on your LinkedIn profile can harm your career. This study, however, is one of the first that tries to quantify exactly how much that “stigma effect” can harm an executive’s career in dollar terms. How’d they do it? The professors, Boris Groysberg and George Serafeim, worked with a global recruitment firm to study more than 2,000 executive-level job placements from 2004 to 2011. They cross-referenced those placements to find people who had worked at companies that experienced a financial restatement at some point in the past. Of the 2,034 placements in their sample, 18 percent had a tainted prior employer. Then they built a model to account for job experience, education, number of years between the restatement in their past and the job placement, and the like. That model let them measure the effect that restatements had on their salary and bonus, compared to comparable executives without a tainted prior employer. Executives specifically in the finance function saw a 9.9 percent discount compared to others without a tainted work history. The authors only studied companies that experienced a financial restatement. But does anyone doubt that similar effects exist for other types of corporate misconduct? Do you really believe a retail banking executive who worked at Wells Fargo during its false-account scandal has an equally job hunt as an executive who didn’t? Or that a senior male engineer at Uber doesn’t get extra scrutiny given its harassment troubles? This stigma effect can touch every executive at a company, even long after they leave, and even if they had no role in the misconduct itself. We can’t forget the anchoring effect at work here, either. Once you accept that new job at 4.6 percent less salary, that number becomes the starting point for your next raise at the next job, and so forth. 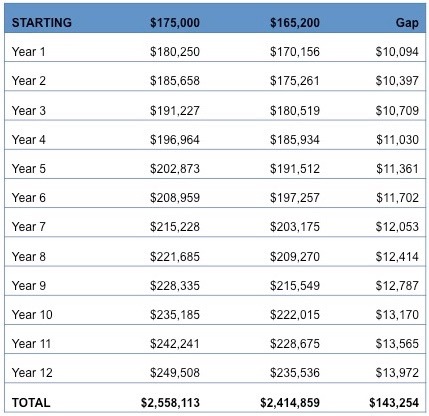 The effect of one restatement can amplify over time, and leave you making hundreds of thousands of dollars less over the course of your career. From an economic theory perspective, you can say that the costs of overcoming that stigma result in the lower pay; it’s a discount rate for the extra time that recruiters and hiring managers spend arguing that, yes, this person should be hired even though he or she worked at Enron in 2000, or at Lehman Bros. in 2008, or Uber in 2016, or wherever. In practical terms, we also have this: if your resume is tainted, you’re probably more hard-pressed to find work and will accept lower pay. Which hiring managers know, and exploit. What should alarm all executives, however — and what compliance executives should use shamelessly when arguing for more budget or more respect — is that this stigma effect can touch every executive at a company, even long after they leave, and even if they had no role in the misconduct itself. Let’s put some numbers around this. Say we have two executives who land jobs in Corporate America. One, without a tainted company in his past, secures a VP job with salary of $175,000. The other quit a tainted company six years ago; it had a restatement four years after his departure. That means he landed a similar job at 5.6 percent less salary, or $165,200. The man with the tainted prior employer — even if he had nothing to do with the misconduct — earns $143,250 less than his counterpart who worked at ethical companies. That’s a mortgage paid off early, nursing care for an ill relative, or a child’s college education. (I mean, state school, but still.) That’s opportunity for a better life gone, because a company potentially years in your past didn’t take ethical conduct or internal control seriously. Yes, you can use that table in your next board meeting or company town hall about why compliance matters. Because it matters.